Episode Summary: Robyn Sue Fisher, CEO and Founder of Smitten Ice Cream, is on a crusade to create the “best ice cream in the world with the touch of one or two buttons.” Using her love of ice cream and head for technology, this woman whom Silicon Valley Magazine called a “rule-breaker and industry innovator” worked for nearly a decade to bring her vision to life. (Silicon Valley Magazine editors also made Robyn their most recent cover star.) 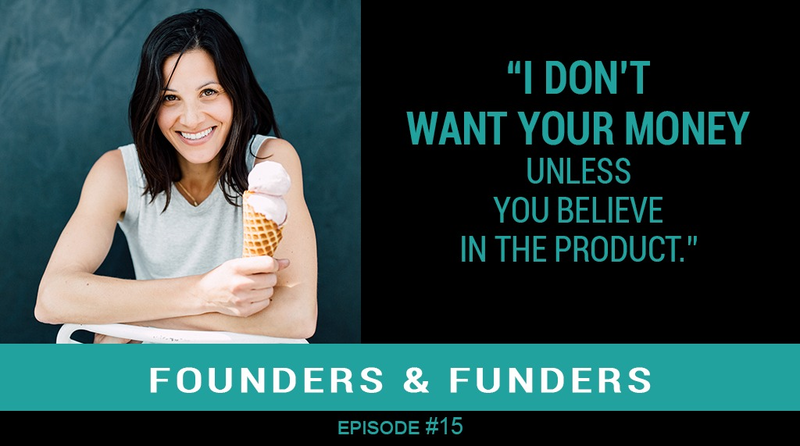 Now that she’s well beyond the prototype phase and elbow-deep into expansion territory, this engaging entrepreneur is here on the Founders & Funders podcast to share her story and give insight into how she managed to finance the dream she’s currently living. Subscribe to Founders and Funders on iTunes, TuneIn, Stitcher, Google Play, iHeartRADIO, and Android Podcast Players. In her own words, Robyn Sue Fisher is a “dreamer, tinkerer, and ice cream rethinker.” In 2007, she founded Smitten Ice Cream with a goal to create the freshest, most flavorful ice cream ever made in three minutes or less with the push of a couple buttons. 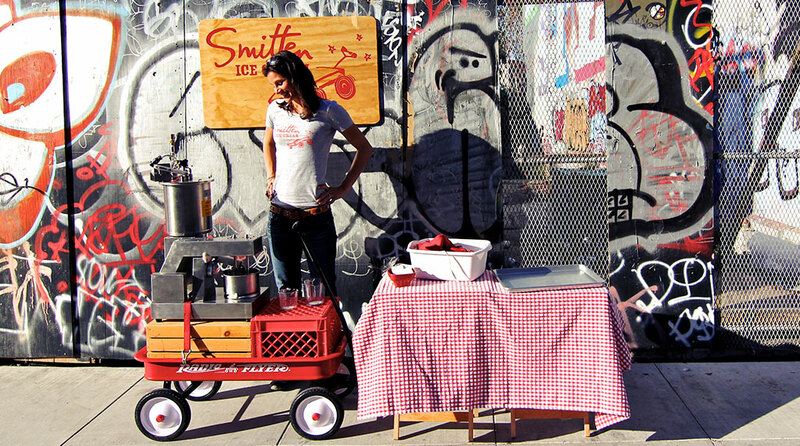 Within two months, Robyn’s Smitten Ice Cream “food wagon” (much more “boot-strappy than a food truck,” she says) catapulted to the top of San Francisco’s foodie scene. Calling the warm reception the first of many “proof points” that Smitten Ice Cream would be a success, this relentless entrepreneur used the momentum from each milestone to strategically move from wagoneering to a single store front — then to a couple storefronts and now to a rapidly expanding small chain of restaurants. In addition to learning more about the Smitten journey, we wanted to have Robyn as a guest on the Founders & Funders podcast for two reasons. The first is that, in our current line-up of podcasts guests, we are focusing on what founders should know about taking outside investments from angel investors, venture capitalists, or other sources of institutional money. Since Robyn recently made this move, we were interested in her perspective on the experience. Secondly, Spike Ventures, the AVG venture capital fund for University of Stanford alumni run by Andre de Baubigny, invested in Smitten Ice Cream. We wanted to share Robyn’s story because we think Spike investors will enjoy learning more about (and be proud of) where their money is going and how it’s being used. If you want to hear more about how AVG funds follow lead investors into deals, listen to Episode 11 with Gail Gilbert Ball. She explains why AVG purposely takes a back seat and how we partner with angel investors and larger VC firms to select portfolio companies. As a kid, Robyn did not have dreams of being an ice cream inventor. Instead, she wanted to play in the WNBA, and she almost became an FBI agent. Though playing professional basketball and being an investigator may seem unrelated to Fisher’s career at present, her competitive spirit, hard work, and resolute pursuit of a solution certainly drove the success she now enjoys. Robyn loves ice cream. She loves the taste, the texture, and the “live in the moment” feeling that eating ice cream inspires. You have to eat ice cream immediately, after all, or it will melt and be ruined. Though ice cream is readily available in grocery stores, ice cream stores, ice cream trucks, and elsewhere, Robyn wanted fresh ice cream — which she could not find anywhere. So she studied the problem and realized that ice cream lost its taste and texture when manufacturers made shelf life a higher priority than the fresh ingredients she craved. Having discovered the reason that ice cream had lost its freshness, Robyn set out on a journey of invention to correct the problem. She could easily get fresh ingredients, but she still needed a way to churn and freeze them quickly. Her research showed that people would wait no longer than three minutes for freshly made, customized ice cream. With a lofty goal to “make the best ice cream in the world with a touch of one or two buttons,” this Stanford MBA grad teamed up with a retired aerospace engineer to create a prototype. The process took much longer than expected, but Robyn says naive optimism helped her persevere. Initially, Robyn set out to make fresh ice cream using liquid nitrogen and the very best ingredients she could find. Once she accomplished this (proof point number one), she took her invention to the streets to see if other people agreed with her. When people lined up around the block to get a scoop of customized ice cream and Yelp listed Smitten as the most popular restaurant in San Francisco for two months in a row, she confidently checked off proof point number two. In addition to sharing lessons learned as a first-time entrepreneur, Robyn talks about the changes to her business and her own involvement with Smitten since taking on angel investors. Her experience has generally been a positive one, but there were lessons to learn and adjustments to make in the transition. Whether you’re an inventor or investor, Robyn’s interview on Founders & Funders will not disappoint, as she offers helpful entrepreneurial advice and insights on what makes a great founder-funder relationship. And if you are already a Spike Ventures investor, you’ll learn more about why Smitten Ice Cream seems like a promising bet to earn a sweet return. If you are a Stanford graduate and want to learn more about how Stanford alumni are investing together, sign up for the Spike Ventures newsletter or schedule a call with Andre de Baubigny, the fund’s Managing Partner. If you are an accredited investor with different university ties (or no college affinity), then sign up for the Alumni Ventures Group newsletter to learn more about how AVG makes venture capital available to the largest collection of potential investors ever accumulated. The newsletter is also where AVG shares information about all the alumni and select funds at the company. You’ll find out what deals are in the works and even receive special offers only made available to this unique community. Founders and Funders is a podcast where we discuss how entrepreneurs and investors work together to build great companies. Our guests — many of whom are connected with AVG as entrepreneurs, investors, managing partners, fellows, and more — are invited here to talk about the journey of building companies from incubation to early stage investing and beyond. Subscribe to Founders and Funders on iTunes, Founders and Funders on Android, Stitcher, TuneIn, iHeartRADIO, and other popular podcast channels to find more fascinating stories and insights from the entrepreneurs and investors who comprise the Alumni Ventures Group community. See all Founders and Funders podcasts.